The Lightning, the most expensive military weapons system in history, is a beautiful aircraft of the most modern conception to date. 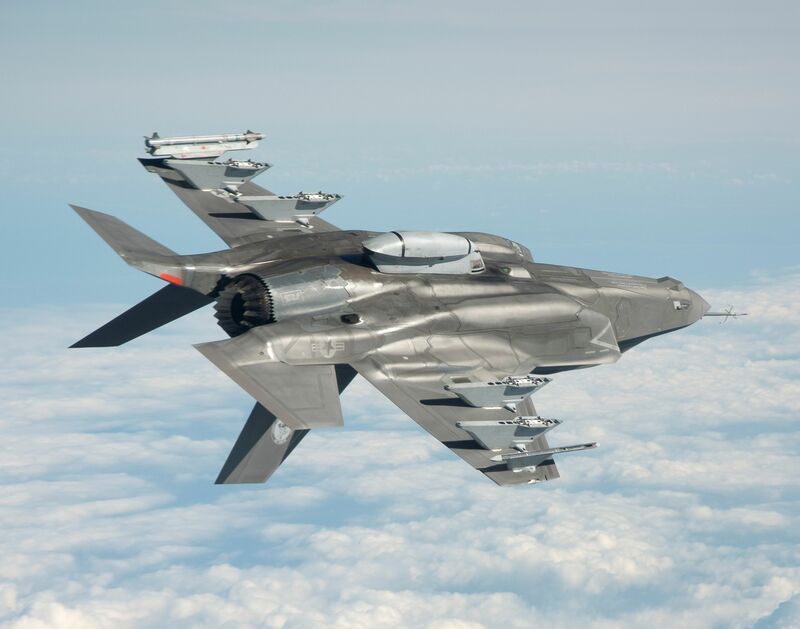 It is the winning design of the Joint Strike Fighter (JSF) program, begun as the Joint Advanced Strike Technology (JAST) program and signed in 1996 as the JSF program. In 2001, out of the competing Boeing X-32 and Lockheed Martin X-35 prototypes, the X-35 design was selected as having the best potential for the United States and the United Kingdom. But because the prototype did not include weapons bays, a redesign caused weight problems and cost overruns of $6.2 billion and took 18 months to overcome. This would be the first of many setbacks with the program. To honour both the U.S. Air Force warbird Lockheed P-38 Lightning and the English Electric Lightning of the Royal Air Force, the new aircraft was named Lightning II in 2006. To save on costs and replace aging fighter plane fleets, the Lightning was designed to take on many roles. It was intended not only to mimic the Harrier in its vertical takeoff capability, but also to incorporate a stealthy design like the F-117 Nighthawk and the F-22 Raptor, as well as replace the F-16 Falcon and the F-18 Hornet in their fighter role and the A-10 Thunderbolt in its ground attack role. 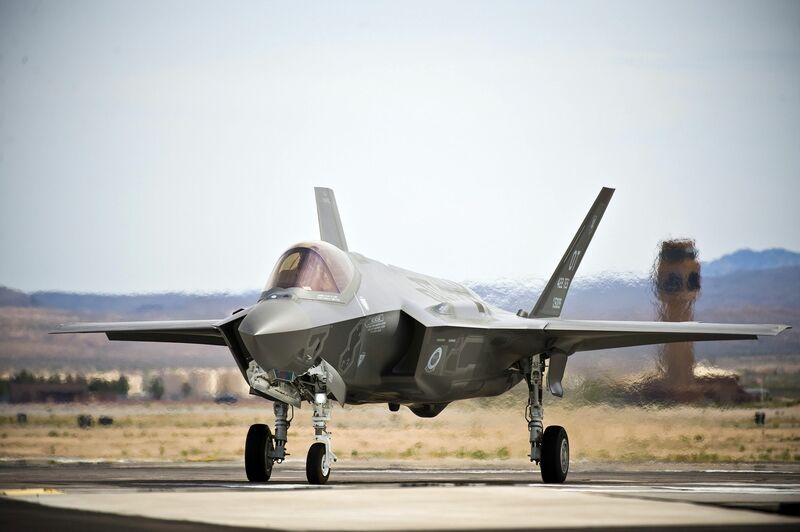 To accomplish those roles, it has three main variants: the F-35A for conventional takeoff and landing, the F-35 B for short takeoff and vertical-landing, and the F-35C for catapult assisted takeoff but arrested recovery. The common design in all three models was planned to allow an 80% commonality between parts. Unfortunately, as many critics claim, the aircraft’s design, with so many goals to attain, has become inefficient in all of them. The aircraft lacks dogfighting energy because of its vertical takeoff constraints – common design transferring those faults to both conventional takeoff versions, and it is lightly armoured and vulnerable in the ground attack role. Also, to maintain stealth, all of its weapons being internal, its ammunition and range is limited. And over all, cost overruns and delays have been exorbitant, further compromising the aircraft (total program costs, adjusted for inflation, amount to $1.508 trillion USD). Nevertheless, the aircraft’s primary advantage lies in its electronic edge, radar evasion, and complete sensor fusion. The cockpit includes a 50 × 20cm touchscreen and a speech recognition system. It also includes a helmet mounted display system which completely replaces the HUD: it is the first fighter in decades without one. This would allow the plane to attack ground targets without directly pointing the aircraft towards them, therefore reducing danger from ground fire. Lasers were being developed as optional weapons for the Lightning, an option allowing it to burn threats out of the sky. The Lightning’s stealth features, although not completely impervious from radar, protect it from the frequency used by missiles and other aircraft, except at close range. Improving upon the F-22 Raptor’s, the F-35’s stealth coatings are baked into the skin and are much easier to maintain. The Lightning’s sensors surround it completely, its devices so sensitive they can detect the launch of a missile 1,900 km away. In combat, such capability would give any aircraft away, even stealthy: such functions are not usually part of a fighter’s design. Using its sensors and communications equipment, an F-35 could control up to 20 UCAVs and plan attacks to targets indirectly. More than 170 Lightnings have been built, and they are planned to fly until 2070. They are in testing and training by the USA, the UK, Denmark, Israel, Italy, Japan, Netherlands, Norway, Korea, Turkey, and Italy. Its acquisition remains contested, and projects such as the Canadian procurement of the CF-35 are uncertain. Israel has acquired its own version under the name F-35I Adir with a plug-and-play feature for add-on Israeli electronics: “The basic F-35 design is OK. We can make do with adding integrated software.” Israel should purchase up to 75 units, and the United States plans to acquire 1,763 in total. Flight testing of the STOVL propulsion system began on 7 January 2010. 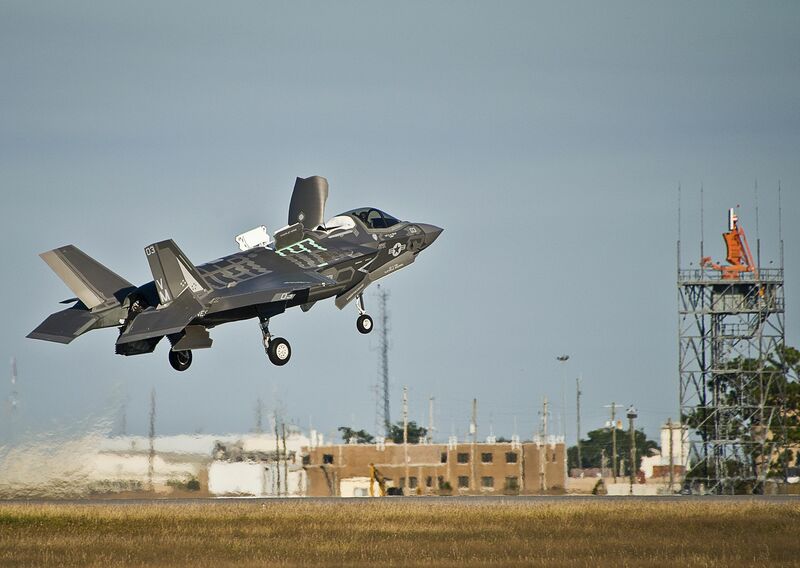 The F-35B's first hover was on 17 March 2010, followed by its first vertical landing the next day. The Lightning's weapons load includes an AIM-9X Sidewinder inert missile on the starboard pylon, a centerline 25mm gun pod, and a GBU-32 and AIM-120 in the starboard weapon bay. 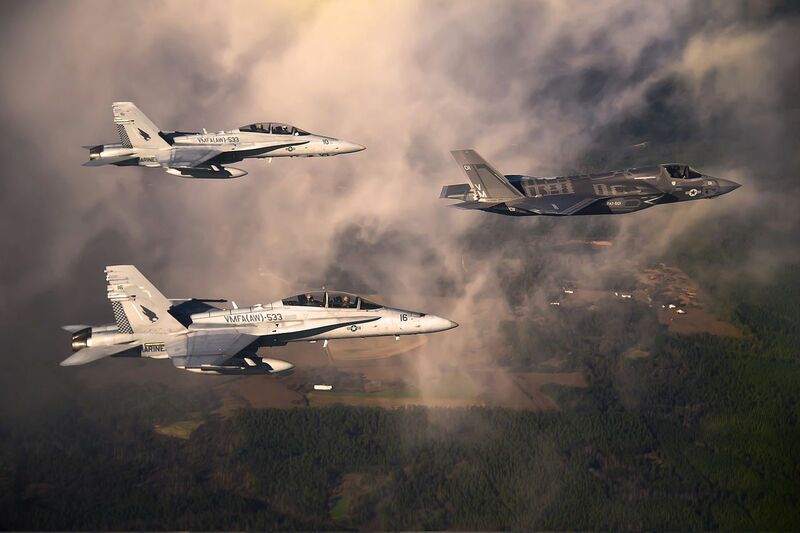 The Lightning accompanied by two Hornets, which it will eventually replace. 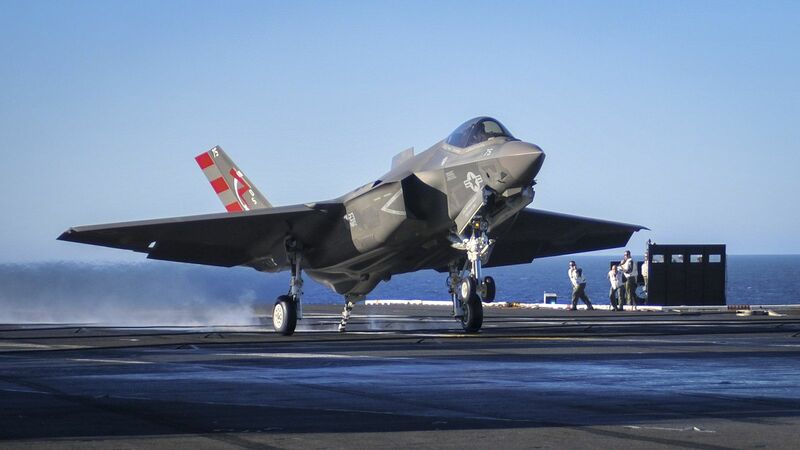 Because the arrestor hook was located too close to the landing gear, the F-35C was originally unable to land on an aircraft carrier. Because of the central lift fan, the Lightning's body is large enough to break the area rule. It compensates this disadvantage by carrying its weapons internally, which reduces drag. Unless otherwise mentioned, this webpage and its content is licensed under the Attribution 4.0 International license. You may quote and copy this material if you give correct credit to the author and do not distort or otherwise change the original meaning of his words. Copying any material on this website without giving correct credit to the author is both plagiarism and copyright infringment, and will be treated as such. Denis G. Labrecque published this document on June 24, 2016. It was last modified on June 27, 2016. Proudly hosted on GitHub using Jekyll markdown.